There are only a few things I can guarantee an interest in keeping up with in my kitchen these days. The first is coffee. The second is nutella. The third is making a fresh batch of granola once a month. To be more inclusive of loved ones' health needs, I have been trying to include cholesterol-friendly foods in my recipe repertoire. I have mastered the egg-white breakfast burrito, and am now working my way up in the world towards granola. For some reason I am starting at breakfast. No idea why. I've googledresearched all the requisite ingredients for a cholesterol-fighting granola. Flax, olive oil, nuts and seeds galore. What makes this granola extra fancy is the inclusion of dried lentils, which I would not have had the guts to try if I hadn't seen it on the Stonesoup blog first. I am now hooked on lentils as a powerhouse secret ingredient in all of my granola recipes! And with all of the other aforementioned cholesterol fighting ingredients, I like to think of this particular recipe as Cholesterol-Ninja granola. I am a sucker for anything tropical, and am extra excited about making food pull double duty: taste good and be good for you. 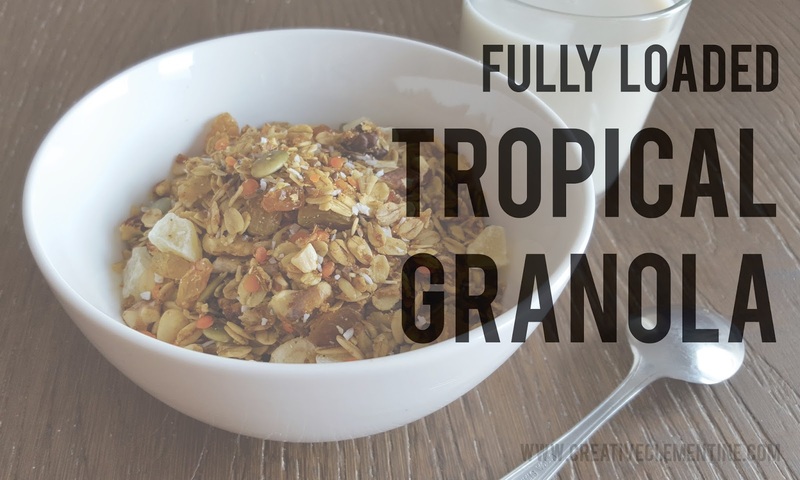 This granola is yummy, tropical-ly, chewy, and--most importantly--a naturally heart-, cholesterol-, and belly-happy recipe that yields a million breakfast servings in under half an hour. Spread onto lined baking sheets in an even layer. Bake for ten minutes then remove from oven and stir. Bake another ten minutes. Remove from oven and mix in the chewy ingredients. Let cool completely. 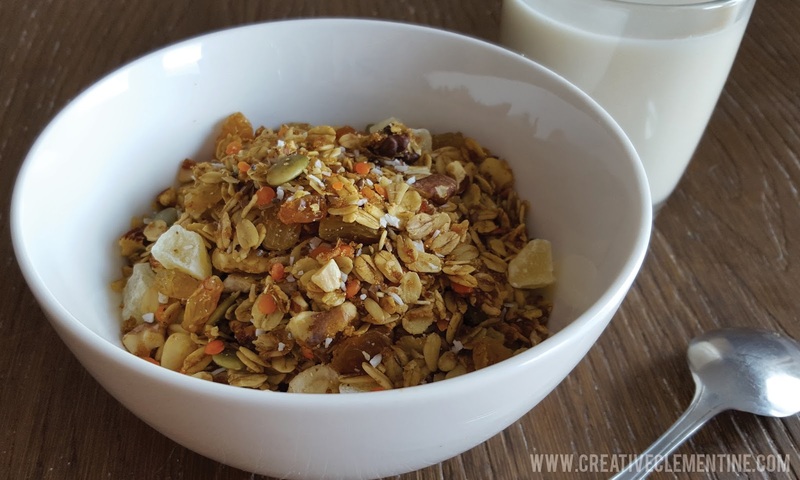 Serve about 3/4 cup of granola with cold dairy or non-dairy milk. Is even better with half a fresh banana sliced into it! Do you have a favourite secret weapon in your homemade granola?? 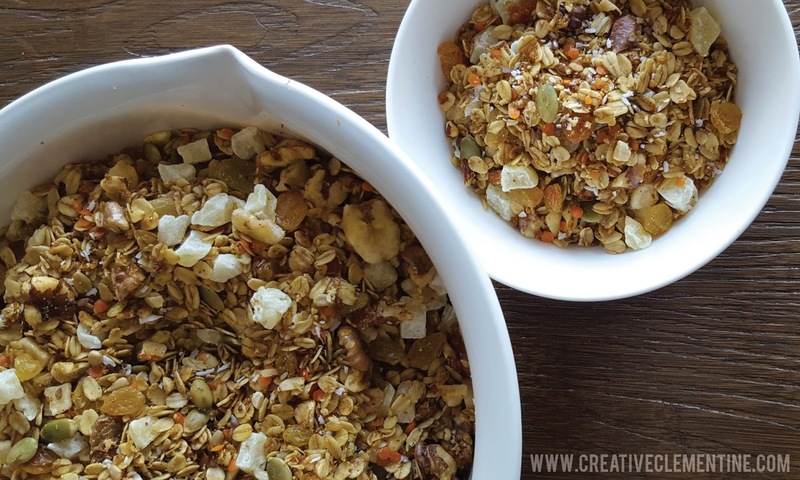 I've never tried making my own granola! That looks yummy!